Recently I had the need to measure the velocity factor of some coax. The velocity factor of a transmission line is ratio of the actual propagation of radio signals through the cable vs the speed of light in a vacuum. It’s RG-6U, for which I have seen published velocity factors ranging from 0.65 to 0.85, depending on the manufacturer and type of dielectric. This coax was laying in my junk box, and I have no idea who makes it, or what the claimed specifications are. The performance of a lot of lower cost coax often widely varies from published specs, as well. One technique to measure the velocity factor of a transmission line is to use a piece of it as an open stub, which is a section of transmission line connected to another line via a Tee connector. The added transmission line is open at the other end, hence the term “open” stub. The open stub will act as a notch filter for frequencies with a wavelength close to four times the length, in other words the stub is 1/4 wavelength. For this measurement, I used an SDR (Software Defined Radio) as the measurement device. In this case an SDR-14. To generate RF I used a noise bridge. 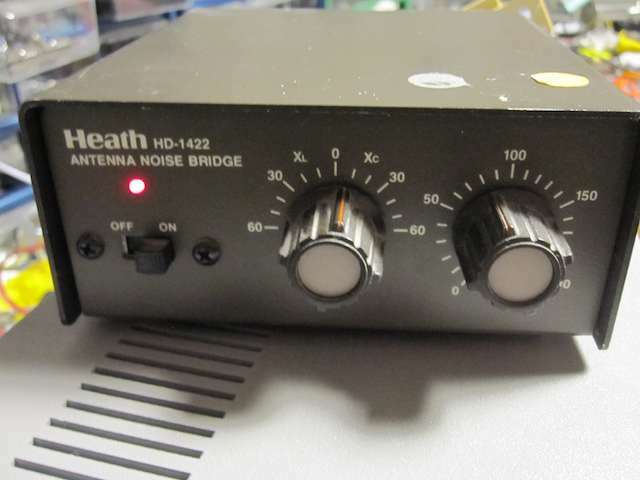 The output of the noise bridge is a good source of wide-band RF. Here is the Tee. On the left is the RF signal, on the bottom is the connection to the SDR, on the right is the open stub. You can see the dip in the signal level, caused by the stub. In this case, the stub was 13 ft (4 meters) of cable. Iif the velocity factor was 1.00 the wavelength would be 16 meters, the frequency 18.75 MHz. The frequency of the center of the notch is 15.7 MHz, so the measured velocity factor is 15.7 / 18.75 = 0.84. Next I used a 9 ft 3 inch (2.85 meter) cable. The wavelength for a velocity factor of 1.00 would be 11.38 meters, the frequency 26.35 MHz. The frequency of the center of the notch was 21.8 MHz, so the measured velocity factor is 0.83. Using both cables, the total length is 6.85 meters, the wavelength for a velocity factor of 1.00 would be 27.4 meters, the frequency 10.95 MHz. 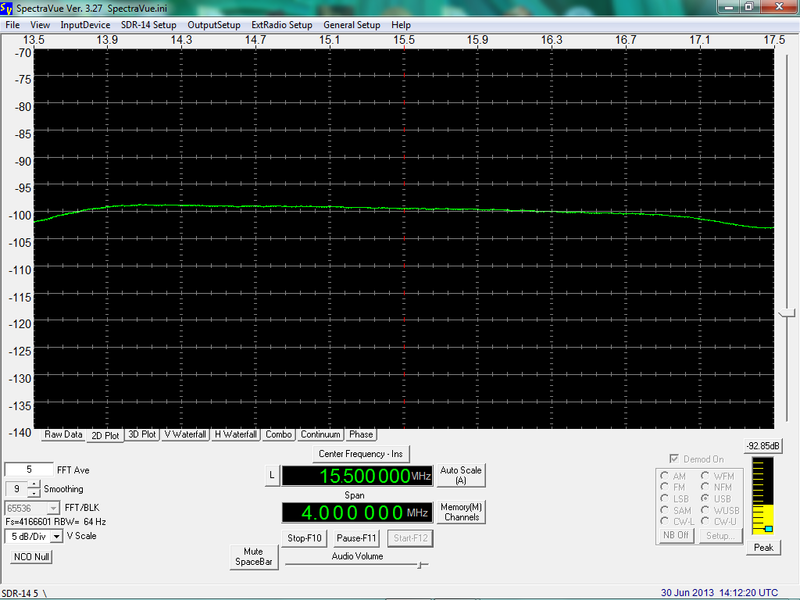 The frequency of the center of the notch was 9.1 MHz, so the measured velocity factor is 0.83. 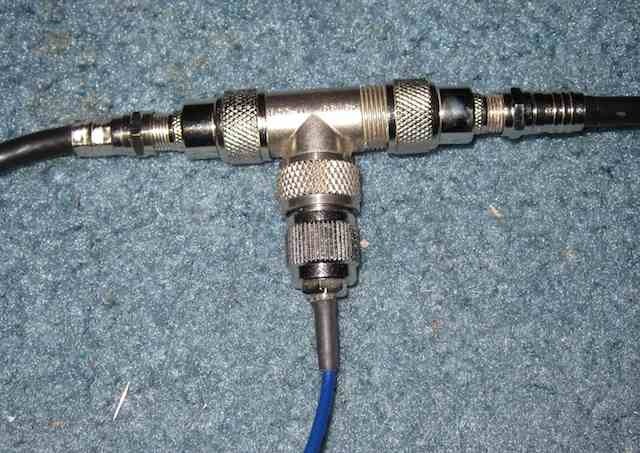 For this piece of coax, the velocity factor seems to be 0.83, which is a reasonable value. This weekend, I’ve noticed a station transmitting periodically on 6914 kHz. It will come on the air for a few minutes, then go off. All transmissions appear to be AM, with a variety of modes, such as CW (so MCW in this case), RTTY, and even some voice. Last night I heard transmissions until the last one ended at 0136 UTC, when they stopped until 0745 UTC this morning. None were noted on the SDR recording during that time period. When the transmissions restarted at 0745 UTC, they were extremely weak. The signal was not the best, so there are some errors in the decoded text. Here is an Audio recording of the transmission. Token has reported this station on both 6914 and 23146.5 kHz back in December 2012.